James Cameron, who directed the Oscar-winning movie Titanic, arrived at San Diego’s Comic-Con — to the world’s largest comic book convention — to show the first public footing from his new disability-themed movie, according to Rolling Stone. 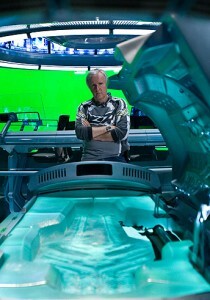 Cameron showed nearly half an hour’s worth of scenes for his sci-fi epic, Avatar, which features a wheelchair-bound soldier who explores a new planet in a tall, blue, reptile-like avatar body. His rival and lover teaches him how to survive on the planet, called Pandora. Sigourney Weaver, who starred in Cameron’s Aliens, has a role as a botanist in the movie. The movie, which opens December 18, is being praised for it’s computer graphics as well as the design that went into creating the alien worlds and life-forms. It turned out to be a great movie that showed that, with a strong mind and some technology, you can overcome all obstacles. You can even win a war.